I know that there is a core group of you who will be turned off just by the title of this article. Personally I’ve always thought meditation to be a seemingly strange practice that for the longest time I only thought was associated with weird, hippie, new-age folk with whom I don’t regularly mesh well. That being said, if you’re anything like me, you have a horribly difficult time relaxing. I’m the guy who famously managed straight-As during one semester of college and then screwed it all up with one “B” in a course called “Techniques of Relaxation.” I suppose I just didn’t relax as deeply as everyone else in the class (or I just opted to skip class one too many times, but that’s neither here nor there). The point is, the ability to clear one’s head and focus is certainly an important skill to have, and meditation can be a step in the right direction toward allowing you to make better decisions both at the poker table and away from it. According to research reported in a recent Huffington Post article by Belle-Beth Cooper, the act of meditation can actually rewire your brain. One of the most significant benefits of this practice is a lessening in anxiety. 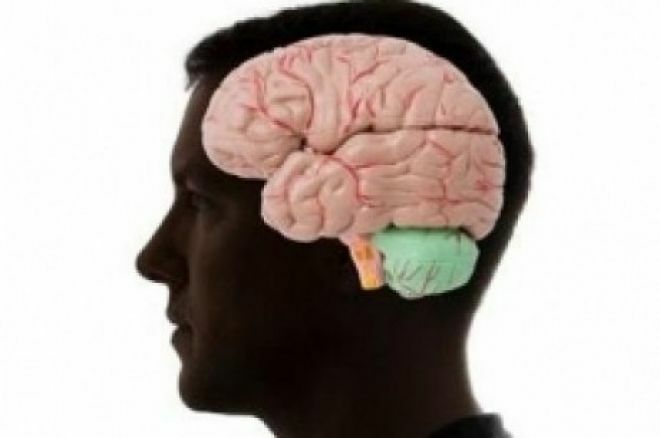 When a person has feelings of anxiety, the part of the brain called the medial prefrontal cortex processes the information experiences a strong sensation, which can lead to feeling frightened or anxious. By engaging in meditation, one is actually weakening the neural connection to this cortex. Ultimately, this leads to meditation allowing the brain to have less of a reaction to sensations that may produce strong feelings of anxiety. What does this have to do with poker? Feelings of anxiety can often cloud a player’s judgment and make it very difficult to think clearly. This seems like an abstract concept, but just picture yourself during a time of great duress at the table. Perhaps it’s your first time cashing in a large buy-in tournament, or you just lost a full buy-in at the cash tables and you’re starting to feel anxious about winning your money back. Such situations are producing strong feelings of anxiety because your brain is, all at once, thinking of the repercussions of your current situation. Meditation can help to soothe the mind in these stressful situations. And why wouldn’t you want a clear head? Oftentimes, you are making decisions that can net you large sums of money while you’re at the poker table. By taking a small amount of time to meditate and clear your head, you are giving yourself a large mental advantage that will allow you to zone in, focus solely on your play, and help to make the best decisions in the game at hand. Meditation has also been linked to improving rapid memory recall. Studies have found that people who practice meditation can focus their brain wave that screens out distractions. This act in turn increases human productivity. This heightened ability to ignore distractions can also be of obvious benefit when it comes to poker. Whether you’re playing online from the comfort of your home or in your local card room, distractions are everywhere. Being able to shop from home or check your social media pages provide strong distractions for online poker, while a plethora of television screens, music, and the general atmosphere of a card room can distract for a live player. Heightening the ability to tune out these distractions can allow you truly to zero in your focus to the game. By remaining focused on exactly what is going on at the table, your ability to pick up on opponent’s tells or betting patterns can be improved. Not only that, but you may be able to pick up on spots or cracks in the game that you otherwise would not have realized when essentially playing on autopilot and remaining unfocused. For a deeper look on the benefits of meditation, check out the video below made earlier this year by Lynn Gilmartin as part of her Stay Stacked series. In this video, Gilmartin sits down with Mish Schaffer, a transformative and creative meditation facilitator, reiki practitioner, naturopath, and owner of Meditation with Mish.